We are regular eaters by nature, never missing one of our three meals a day. No matter how busy we get, our stomach alarms let us know it’s time for breakfast lunch or dinner but time does not exist in the City of Las Vegas and somehow our stomach clocks get thrown off by all the excitement around us. 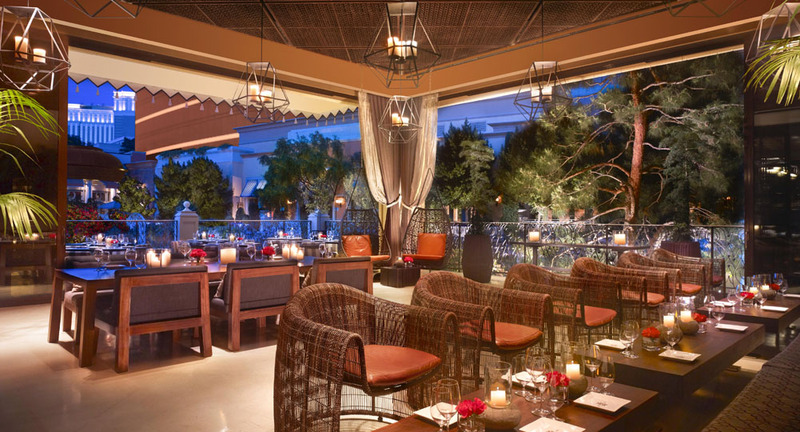 The answer to the Las Vegas time challenge dilemma is La Cave, the newest edition to the Wynn restaurant portfolio. Developed as a wine and food hideaway, La Cave serves as a fine retreat for foodies and drinkers alike. 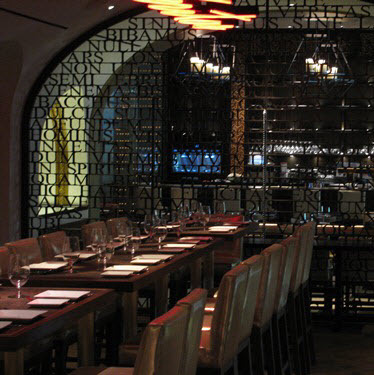 The dim-lit restaurant and wine bar transforms you to a cozy retreat for lunch, dinner, late night eats and or drinks. The ambiance is created with modern furnishings, dim lights with splashes of blue and pink mood lighting and upbeat music to take you away from the jingling slot machines outside in the casino. The restaurant is divided into three parts including: the front, furnished with a full bar and high top tables overlooking a wood-burning pizza oven, the back – a more traditional set up with candle lit tables and an outdoor terrace giving you a completely different experience. We sat at a table in the back and the server came over immediately. After learning we were first timers, she summoned the sommelier to help us with our wine choices. He suggested one of their unique wine flights consisting of four, 2 oz glasses of wine from different regions around the world. He created these to complement the tapas style dishes on the menu. They offer five sets of flights to choose from, two white, two red and one mix and match. We decided to go with the flights since we are working on fine tuning our wine pairing skills and this was a great way to challenge our palates. The server arrived a few minutes later with a wooden tray with four stem-less wine glasses. The menu has a nice selection of everything from the cleverly seasoned lighter selection of Ceviche and seafood to what we would call comfort tapas like Rigatoni Pasta with grilled chicken and basil cream, Beef Filet Crostini with blue cheese, or Baked Clams with Pepperoncini and Chorizo and a nice range of brick oven flat bread pizzas including a more basic Tomato Micro Mozzarella and Caper as well as a Proscuitto, Carmelized Onion and Arugula among others. They also offer an array of cheeses and meats for a lighter snack or great wine compliment. Our first selection to arrive was The Jumbo Lump Crab Cake Lettuce Cups, a refreshing start seasoned with citrus. Next we moved on to the decadent Mushroom Grits made with Pecorino Cheese. We both thought this was “the dish,” something we will crave forever. From the Grill we selected the delicious and juicy Mini Angus Burgers with Mushroom, Chipotle Mayonnaise. From the Farm we chose the Bacon Wrapped Dates with Blue Cheese Fondue a yummy blend of sweet and salty that melts in your mouth. Just when we thought we had tasted all of the best things on the menu, the incredible flatbread pizza arrived topped with Nueske Bacon, Poached Quail Egg and Fontina Cheese. We could not stop praising Executive Chef William Demarco for his brilliant combination of flavors. Although we were quite full by the end of the meal we had to at least try one of there delightful sounding desserts. We settled on the Caramel Peanut Chocolate Bar. It came in the form of two chocolate lollipops topped with crushed peanuts and filled with ooey gooey caramel. This was a luscious end to a delicious meal. La Cave has something for everyone. A great find that we enjoyed so much, we returned the next day for wine and Ceviche in the afternoon.